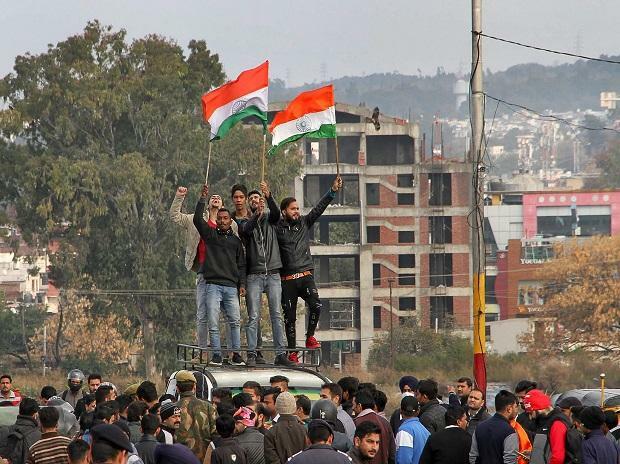 Curfew was imposed in Jammu city on Friday and the Army conducted flag marches in sensitive areas following massive protests and incidents of stone-pelting and arson over the Pulwama terror attack in which 40 CRPF jawans were killed, officials said. Internet was shutdown in Jammu as a precautionary measure, they said. Defying curfew, angry people took out rallies against the attack and police had to cane charge to disperse the protestors at Residency Road, Kachi Chawani and Dogra hall areas, while a bandh was observed in the city. Five vehicles were set afire in Gujjar Nagar area, while several others were overturned by protesters who alleged that there was stone-pelting on them from rooftops when they were taking out marches against the attack, they said. The curfew was imposed in Jammu city as authorities feared a communal backlash, the officials said. Divisional Commissioner Sanjay Verma told PTI that the administration had called for the Army's help which conducted flag marches in Gujjar Nagar, Shaheedi Chowk areas. Verma said additional forces were deployed in sensitive areas. As per reports, the violence was triggered when a rally was being held in Gujjar Nagar area and some people threw bricks on the protesters from rooftops. Purported videos of stone-pelting from the rooftops and burning of vehicles went viral on social media. Police teams rushed to the spot and resorted to teargas shelling and cane charge to disperse angry protestors. Jammu Chamber of Commerce and Industries (JCCI) had Thursday called for a shutdown in Jammu in protest against the killing of CRPF jawans in the terror attack. A complete bandh was observed in Jammu, with no traffic plying on roads and all shops and markets remaining closed, officials said. Massive anti-Pakistan protests were held at Jewel Chowk, Purani Mundi, Rehari, Shaktinagar, Pacca Danga, Janipur, Gandhinagar, Bakshinagar, Muthi, Talal Tilloo and Satwari among other areas. Raising anti-Pakistan and anti-terrorists slogans, the protestors burnt tyres and placed barricades on several roads, saying Pakistan was a sponsor of terrorism in the valley. Led by Bajrang Dal, Shiv Sena and Dogra front, the people also took out candlelight marches in the city and held protests. The Jammu and Kashmir High Court Bar Association, Jammu, suspended work in all courts in the city, including the high court and tribunals, as a mark of respect and to express solidarity with the bereaved families. Ikkjutt, an organisation advocating tri-furcation of Jammu and Kashmir, paid floral tributes to the 40 personnel killed. Its patron, Hari Om, said the situation in the state had turned very alarming. He lashed out at former chief ministers, claiming their security should be withdrawn as they were preaching soft-separatism in the garb of mainstream politics.